This is a receipt that doesn’t document the purchase of a commodity or a service, but the transformation of one form of money, in to an other – one form of money, which generally enables purchase into an other form, where exactly this basic function of money is impeded. This receipt deserves a special explanation. 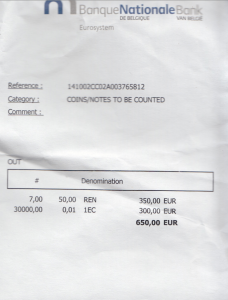 In the course of a workshop called Occupying Democracy / Occupation Précaire one participant translated 650€ reserved for material expenses of the Workshop into 1 €Cent coins – an amount of copper which weights about 350kg. The monetary value is kept – just its applicable value is abrogated! rt work in itself with conceptual and genuine artistic value. Through the simple act of translating the materiality of money in to an other consistency without chaining its monetary value but to discard with this it’s functional usability, the sum of 650€ becomes an artifact – a sculpture in it self. The provided receipt is in so far the proof not only of an act of ‘buying’ the essential artifact of this act, but is part of it’s social plastic. Money is used here to create art in the most possible direct way. In the frame of the a.pass trimestrial Block 2014/III reflecting on the relation between ‘Space and Contract’ Co-curated by the Associate Program Curator Vladimir Miller and the Program Coordinator Nicolas Galeazzi, we asked Christoph Meierhans and Luigi Coppola to come up with a workshop proposal based on their individual artistic practice on democratic forms. Luigi Coppola and Christophe Meierhans are working in different contexts and with different means about common decision taking procedures – or let’s say, alternative democracies. While Christophe proposes in a lecture performance series a new democratic system based on disqualifying people in charge, rather than electing them, Luigi is developing social choreographies as democratic models and is currently involved in a communal project of reorganizing the political, agricultural and economic system of a whole village in south Italy. Together they propose a research workshop where most components of its activities will have to be decided commonly with the workshop participants. Just the very basic conditions are determined: The workshop occupies a public space with only one person at the time – 24h a day. Starting with one square meter of occupation, the territory of artistic occupations should be expanded for minimum one square meter with every occupant. The rest of the group develops, discusses and observes the occupation from a distance and takes the relevant decisions. The discussions and decision taking procedures already started last block and created some new questions and tendencies. But an entrance into the process is possible at anytime. concept together in shifts of 2h per person. The occupation was held on Place Saint-Jeans in Brussels. A Budget of 800€ was on spot and available to the current occupant in order to increase the tension between the decisions of the individual towards the decisions of the Workshop collective. Beside the occupation, the group held daily plenum gatherings at an other place in town, discussing the development of the occupation and its ethical, artistic and political implications. The fact that one person is in charge for the budget of a group for only 2h at the time reviles obvious conflicts of interests between the ‘society’ of this workshop and the individual occupant and was therefore the most concrete challenge of the idea of rethinking democratic systems through this workshop. At the beginning this challenge wasn’t faced much. The occupants only moderately bought things for their own use and bigger sums were only spent on objects that had a value for the whole group. The group fully accepted, that someone buys a beer for his midnight shift, or a morning juice, some chips, or batteries for his/her camera etc. Someone bought a Kalimba as the lullaby music instrument of the whole group. Someone else Gloomy Sticks – a scenographic element, which structured the space the whole week after. Occupants contributed even more private material and made this way the available money partially obsolete. This surely very interesting attitude suspended therefore, we might say paradoxically, the challenging discourse of the workshop. The tension embedded in the experimental concept of the workshop wasn’t fully embraced and experienced. The sum of those small expenses didn’t exceed 125€ and didn’t contribute much to the curtail discussions. The receipts for this sum are available and can be justified. One occupant interpreted the responsibility of the budget available in the explained transformative way. He went with the at the point remaining 650€ to the National Bank and was allowed to translate the bills into coins without any concern. The restriction related to these cases is, that one can change an infinite sum into smaller coins, but one is only allowed to bring 1€-cent coins back to the bank in portions of 5kg a week! In our case, this would take us almost one and a have year of weekly engagement to walk coins back to the bank. This conceptual act changed the situation in the workshop drastically. The collective was confronted with a radical individual move, which challenged everyones responsibility. The unpracticality of the available money in this form occurred when other occupants wanted to buy just a little chewing gum at a night shop in their shift – none was willing to take these coins. No night shop, no café, even giving them away for free was impossible. The only ones who saw the value of this conns being transferred in something real, practical and useful were a bunch of homeless people. Their time and economy allows to spend hours for picking up the coins, carrying them to around, negotiating with potential takers only to get the sum for example of a weekend ticket to the Ardennes together. A holiday dream some of them were waiting for since ages! With this aspect, the precariousness of this occupation entered other dimensions. It sets our abstract discussion on a slippery yet concrete and practical experience. The Workshop givers and the program coordinator who are finally responsible the workshop were suddenly under totally different the pressure of justification. The reviled presence and unavoidable openness of the money – we hardly could hide the 350kg coins in the public space – was constantly under thread of being stolen. It opened a communication to the most precarious living participants of this society. The group had to find new and concrete solutions for the technical and ethnical handling of the money and was confronted with an urgent decision finding process and it’s mechanisms. At the end of the week long occupation we left the space with about the half of the transferred 1 €-cent coins – ca. 170kg – in a suitcase together with a protocol for further operations. An Open Call shall be launched for competitive proposals to perform the coins. The selection procedure will follow principles that were discussed and tested in the workshop. The proposals will all be read on one evening to the public. Only after the reading one member of the audience will randomly be chosen to act as a one-man-jury select a winning proposal. Another person has to be chosen randomly for as a performer of the proposal. The social plastic has to go on!